In a 1988 conference, American and British scholars unexpectedly discovered that their ideas were converging in ways that formed a new picture of the variegated Hellenistic mosaic. 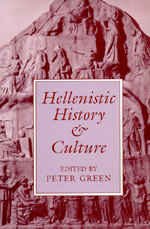 That picture emerges in these essays and eloquently displays the breadth of modern interest in the Hellenistic Age. A distrust of all ideologies has altered old views of ancient political structures, and feminism has also changed earlier assessments. The current emphasis on multiculturalism has consciously deemphasized the Western, Greco-Roman tradition, and Nubians, Bactrians, and other subject peoples of the time are receiving attention in their own right, not just as recipients of Greco-Roman culture. History, like Herakleitos' river, never stands still. These essays share a collective sense of discovery and a sparking of new ideas—they are a welcome beginning to the reexploration of a fascinatingly complex age. Peter Green is Dougherty Centennial Professor of Classics at the University of Texas, Austin. Novelist and scholar, his recent books include Alexander of Macedon, 356-323 B.C. (California, 1991), Alexander to Actium (California, 1990), and The Laughter of Aphrodite (California, 1993).